If you have looked at the pages of this website, and you have more questions than answers about the effects of a National Park Reserve, then you are part of our community. If you want transparency with the process of exploring the true consequences of a National Park Reserve, then you are part of our community. If you care about the environment, but think that the decisions that are made about the future of our area are best left to locals, then you are part of out community. 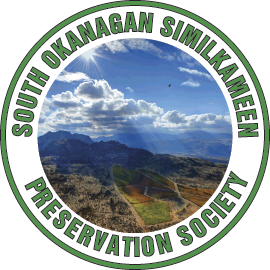 We are a non-profit society that are looking for members, and for as little as $10 per year, that membership fee will go a long way for protecting the environment and lifestyle we cherish in the South Okanagan Similkameen. At this stage, we are accepting Interac E-transfers of funds, and good old hand written cheques. If you would like to send a donation for membership, please use Interac with the email: info@sosps.ca. Please use “NoNPR” as the password for the funds transfer. It should also be noted that once you are a member, you are not limited to a simple donation of $10. You may donate any amount in addition to your $10 membership fee. The education campaign will be a long and expensive process, so your donation will go a long way to preserving the environment and lifestyle of the South Okanagan and Similkameen regions. We’re also accepting membership payments via PayPal with credit cards.